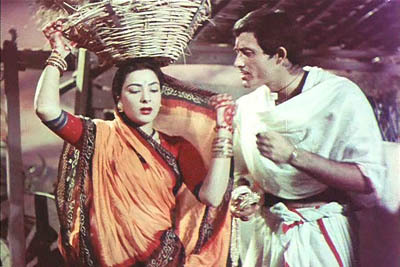 Shamu (Raaj Kumar) marries Radha (Nargis) with a lot of traditional fanfare. The bride arrives at her new home. The groom is awe struck at the beauty of his bride. The first meeting of the groom and the bride after the marriage ceremony upon return to the groom's house. 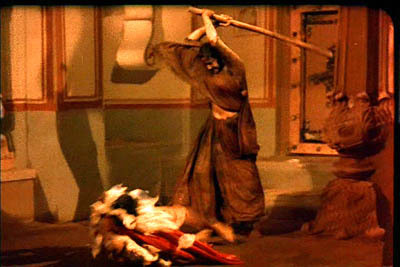 Without using any dialog the scene in the movie gives expression to the traditional supremacy of man over woman! The wife is pressing legs of the husband while he snores and sleeps comfortably. Radha learns that her mother-in-law has pledged their fertile land for a loan of Rs.500 so that the marriage takes place in a great fanfare. Radha proves herself to be the ideal wife and takes over the charge of the household chores to give relief to the aging mother. Being a farmer's wife, Radha is here shown milking the cow as a part of her daily household chore. 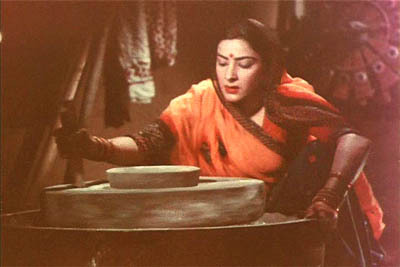 Radha making butter milk. 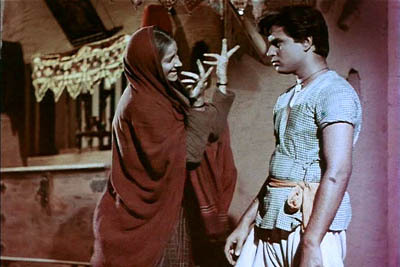 Shamu arguing with Radha as to why she has removed her ornaments and got totally involved with so much work. 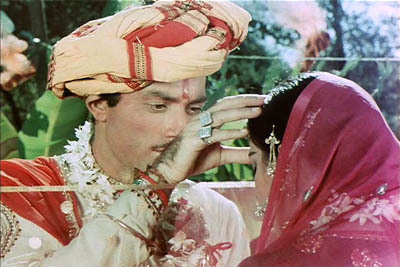 Shamu insists on putting back the ornaments on Radha. 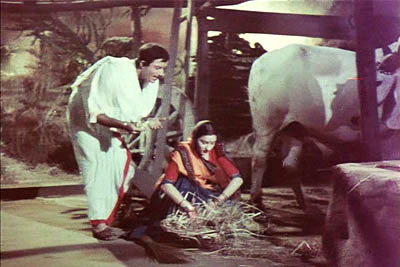 Radha and Shamu working together in the farm. Shamu ploughs the fields. 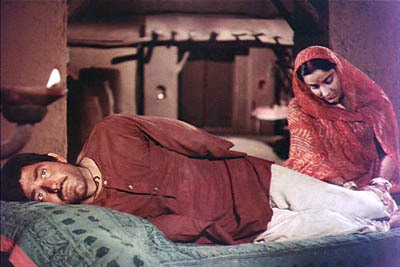 Radha after becoming mother of a child continues to work with her husband Shamu as they have to pay off the loan. 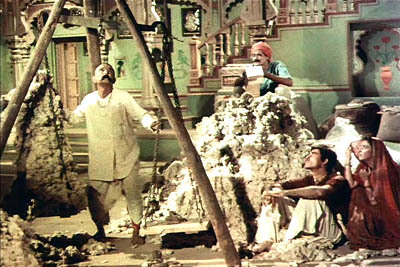 Shamu and Radha watch in dismay the three-fourths of their crop being taken by the Lala (money lender) as interest towards the loan of Rs. 500. Time moves on. Years pass by. Shamu and Radha now have more children. The tense expressions depict the problems of poverty and population explosion. Radha suggests and insists that they break their barren land which is not mortgaged. This barren land is laden with rocks. While attempting to remove big rocks, first they lose their bullock and then catastrophe strikes when Shamu loses his arms. 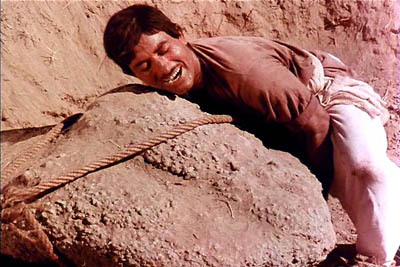 Radha screams for help when Shamu's arms get crushed under the weight of the big rock. Handicapped, helpless and still under debt, Shamu suffers his worst humiliation when the Lala takes away his bulls and puts the bullock bells on his neck. His self esteem lost, Shamu is utterly frustrated and decides to abandon the family...never to return. 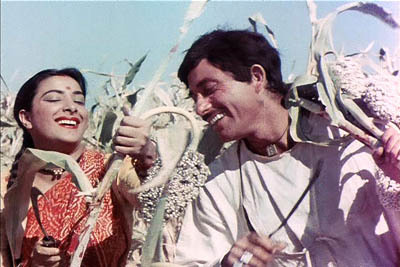 I think Raaj Kumar gave a sterling performance while portraying the suffering, humiliation and his subsequent departure depending more on gestures than dialogs. 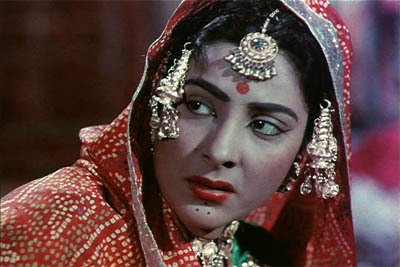 Radha realizes to her utter dismay that her husband Shamu has left the house. A chain of tragic events follow - first the death of her mother-in-law and then the flood that destroys all her crop bringing her to a state of complete penury. One of her child is washed away in the flood and another dies of hunger leaving her with two of her four children. 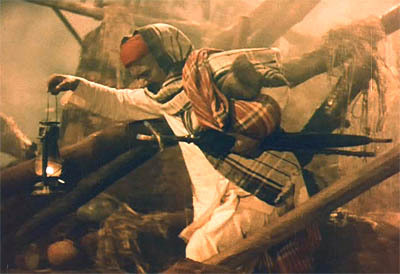 In the flood ravaged ruins Lala Sukhi Ram (money lender) deftly played by Kanahiya Lal, tries to lure Radha to become his mistress so that he can provide food and shelter to her and her children. His persuasion does not yield any results as Radha turns him down only to discover that her second child too is going to die of hunger. When Radha realizes that her second child too may die of hunger that she volunteers to surrender to Lala, being totally overwhelmed by her maternal instincts and the fear of the death of her children. 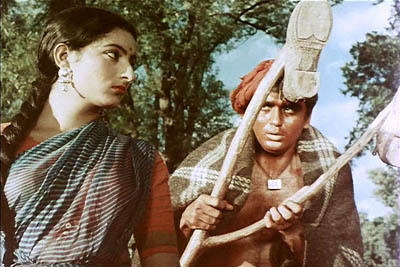 The fear of Radha is however short-lived and regaining her strength she leaves Lala after giving him a good thrashing with the stick. The irony of fate, emotional pangs, matriarchal instincts, honor of womanhood and self esteem are aptly presented through these shots. Gathering courage and determination, she takes up upon herself to combat the devastation caused by the floods, poverty and hunger. Radha hereafter is the symbol of motherhood and strength. Nothing can stop Radha now. 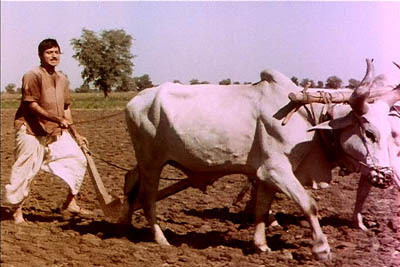 She even dons the role of the bullock so that the fields can be ploughed. 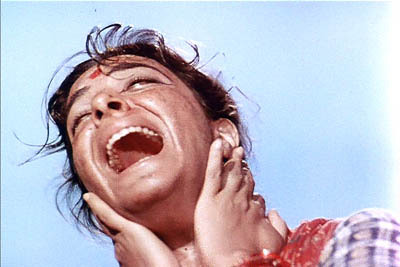 This particular image ultimately became the trade mark of Mother India and Nargis. Courage, determination and single minded intent brought the change with the passage of time. The jubilant mother with the sons of the soil. 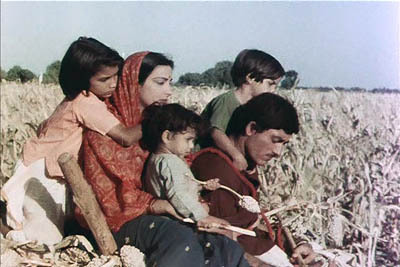 Ramu and Birju have grown up, portrayed by Rajender Kumar and Sunil Dutt respectively. Radha has been able to make men out of her children but not yet been able to purchase bullocks. 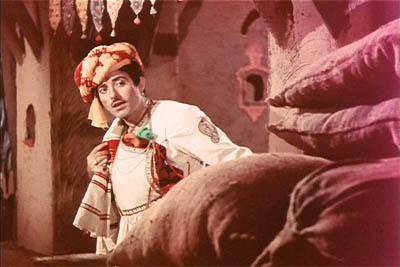 While Radha wonders at the doings of Ramu, Birju is the unharnessed raw energy. Raw and mischievous Birju who eventually becomes a bandit. 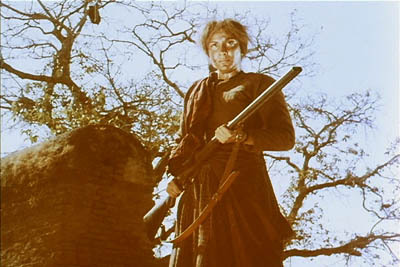 To protect the honor of Lala's daughter who has been abducted by the Bandit Birju, Radha has no hesitation in picking up the gun and shoot her own son Birju. Time to Reflect. 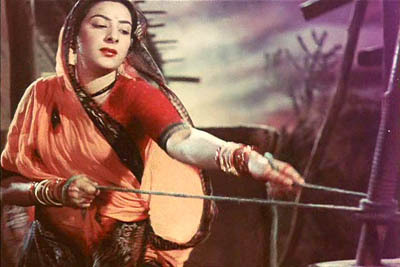 Radha as 'Mother India' reflecting upon the past. 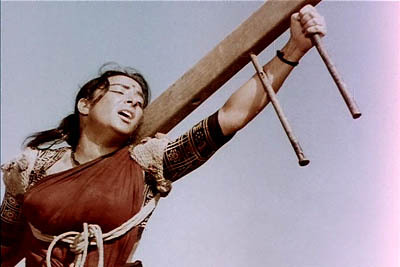 Enough has been written about the movie; yet, it can't be denied that Mother India was , is and will be a great classic in the years to come.Unfortunately, I feel that with Mother India, Nargis had reached her zenith ; sometimes it happens - if you achieve something spectacular then it becomes difficult to follow up with that. 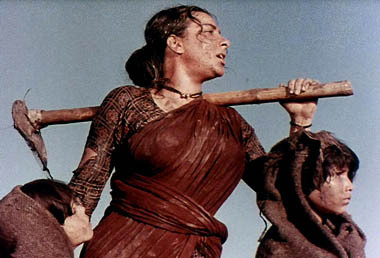 All the other Nargis movies that followed 'Mother India' were mediocre - like Adalat, Lajwanti etc.That was because 'Mother India' was too good.